Typical weekend procedure. Work hard. Play harder. Deal with the Jangover. Wait…the “J”angover? Yup, this weekend was the Javelina Jangover Night Runs by Aravaipa Running in Phoenix, and I just happened to be in Arizona. Unfortunately for me, this Jangover would hurt more than normal. 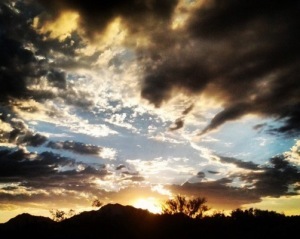 I arrived shortly before sunset at McDowell Mountain Regional Park in Fountain Hills, Arizona. Runners were buzzing around the parking lot, preparing hydration packs and donning headlamps. With the daytime temperatures peaking in triple digits the only way to run a trail race this time of year is to do it at night. My cell phone buzzed with an emergency text alert warning about potential dust storms as the forecasted thunderstorms approached. It was going to be an interesting night. In the start/finish area I ran into friends Maria Walton, Patrick Sweeney, Michael Farris, and more runners from the Born to Run events, CYA ultras, and other races around Arizona and California. Participants could choose from the 7K, 25K, 50K, or 75K. It would be the 50K for me. It had been 5 weeks since I completed the Burning River 100 mile run. The first week I didn’t run at all, the second I made it 15 miles, the third I ran 27 miles and I took the fourth week off. I figured it was time to ratchet back up to a 50K, or so I thought. The 50k ran the loop clockwise first, then the same loop counter clockwise to complete the 31 mile course. 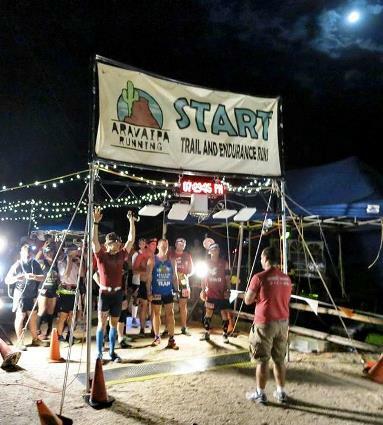 We traded the energetic start/finish area for the dark expanse of the Arizona desert. Runners wound along a wide dirt trail, headlamps bouncing up and over ridges and around large cacti. I clicked on my headlamp as the rain started falling. The droplets drifted in front of my face and illuminated by my headlamp it looked like falling snow through a car’s headlights. The dust kicked up by the line of runners ahead contributed more to my hazy view as I tried to navigate through deep sand and rocky trails. I settled in with a group of runners and ran behind Magi, a local trail runner who knew the Pemberton trail. I was glad to be running behind someone who knew the way as it took me awhile to get used to spotting the trail in the sparse desert brush. Multiple times Magi turned right and I almost turned left, even though I knew I should follow her. Eventually I figured out how to stay on the trail, which was good considering the fact that I ran most of the last loop alone. 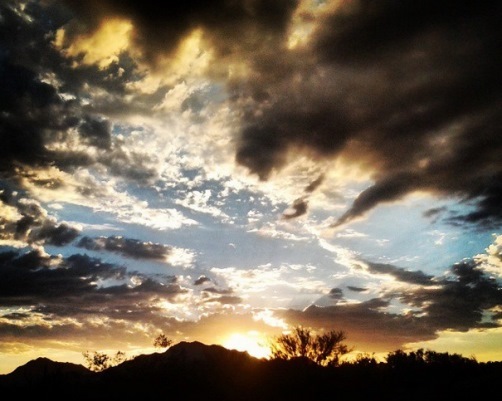 We ran all night under the shadowy silhouettes of the McDowell Mountains, pitch black against the ambient glow from the city lights of Phoenix to the west. Every few minutes the entire landscape would be fully illuminated like high noon by a streaking lightening strike across the horizon. Most would be followed by the low rumble of rolling thunder as it crossed the desert floor and echoed against the mountains in the distance. An hour into the race the soft drizzle of rain intensified into a steady stream of water. In no time we were drenched. The cool water felt great until the storm let up and the hot, muggy air returned and created a desert sauna. My shoes were wet and the heat radiating from the desert floor made my feet so warm and uncomfortable that all I could think about was changing into my Luna sandals after the first loop. I ran the first 8.5 miles to the aid station with Magi and a few other runners. We were cruising and entered the aid station together. I hadn’t changed the batteries in my headlamp from the Burning River 100 and by mile 7 it was dim and dying. I dropped my pack to the ground to change my batteries and Magi didn’t even stop to refill her water bottles. Uh-oh, there went my trail guide. Then the other two runners from our group grabbed a few snacks and were gone before I had my battery change complete. Hmmm, it was time for me to figure out how to follow the trail on my own. Leaving the aid station I almost got lost a few times, but eventually I was able to pick out the compressed footprints of the runners ahead of me. From here I started a downward spiral. It wasn’t bad at first, my feet were hot and I wanted my phone for some music. I was moving, but knew that I’d need something to get me through the second half of the race. I planned to make it to the start/finish area and stop by my car to change footwear and grab gear, but I rounded the corner to see the halfway point at 2 hours and 30 minutes, on pace to get me to my PR in the 50K. With a momentary boost of energy, and slight insanity, I entered the aid station, grabbed some fuel, and headed back out on the course. No bueno. About a mile back into the dark desert the wheels started to fall off. That’s actually a bad analogy for this situation, maybe “got hit by a truck” fits better. More specifically, I got hit by a truck, square in my backside. The tension was back in my hamstrings, worse than it was 5 weeks ago in the Burning River 100, and this time I didn’t have a crew to help me roll it out. I limped along and walked the majority of the trail from the half way point to the aid station, seriously considering turning back and DNF-ing my first race ever. The closer I got to the aid station the more I figured I’d be able to finish, even though it was bound to be very uncomfortable. After refueling at the aid station I left for the final 8.5 miles alone and planned to walk. Much like the end of the Burning River 100 I really didn’t want run, but I also really wanted to get it over with. Of course, the fastest way to get to the finish is to run, so even though it was the last thing I wanted to do, I ran. I traversed the trail in the dark, following the spotlight of my headlamp, every now and then sidestepping to avoid trampling on the massive tarantulas sitting in the middle the trail. I passed a few other runners, the only indication that I wasn’t the last person out on the trail, and eventually started to recognize some of the landmarks that I knew were close to the finish. Just over 6 hours after the start of the race I rounded the corner and burst out into the glow of the finish line lights, crossing at 6 hours and 7 minutes. It was 40 minutes slower than my PR, but I was just happy to sit down! Maria cheered and handed me a cold Miller High Life as I finally took off my shoes to let my feet breathe. It was 2:30 AM and the crowd was smaller but still energetic. I grabbed my Big Flats beer ($2.99 six pack from Walgreen’s!) and Maria and I pulled up chairs to watch the other runners cross the finish line. In no time we were volunteered to hand out the awards and snap finish line photos. We took pictures, drained the six pack, and transitioned to strong coffee as the runners continued to stream in. The final runners crossed the line within minutes of the cutoff at 7:00 AM as the desert sun rose in the east, painting a palate of pink and orange hues across the sky. At 7:05 AM Maria and I were relieved of our duties and we drove to Mike Miller’s house to reconvene with Patrick Sweeney and sleep for a few hours. Sweeney had killed it, taking 2nd place in the 25K and Mike Miller placed 7th in the 50K. Midday Sunday we all parted ways, Maria staying in Phoenix, Patrick catching a flight home on Tuesday to LA, and me spending one last week in Prescott before heading back to Santa Barbara. 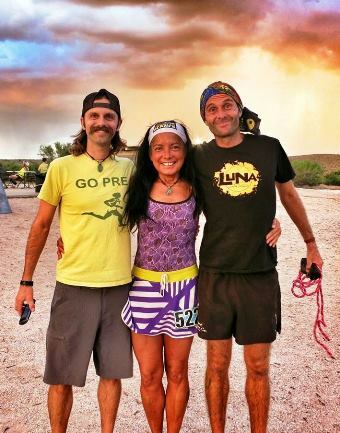 It was another amazing weekend with our tribe of dirtbag ultrarunners. Great friends, good times, and beautiful landscapes. The Jangover Insomniac run was my first experience at an Aravaipa Running event and it was awesome. Jamil and Nick Coury (along with their family) put on some great events! 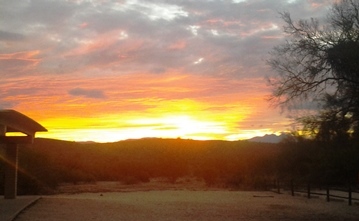 If you find yourself around Arizona check out www.aravaiparunning.com to experience it for yourself. You won’t regret it!